Lay’s, it seems, is always looking for a new flavor for its line of potato chips. Previously, the chip-maker as hosted a “Do Us A Flavor” contest, resulting in customer suggestions like the Crispy Taco and Chicken & Waffle potato chips. 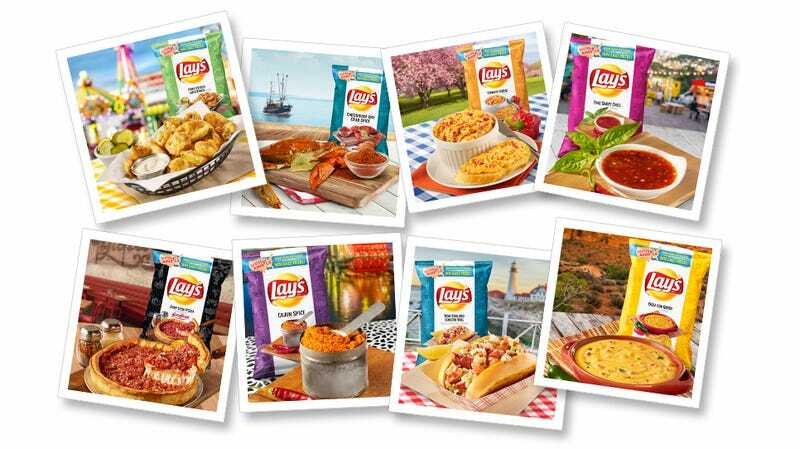 But the company’s latest effort appears to be even more ambitious: Lay’s “Tastes Of America” will feature eight new flavors representing distinctive tastes from every part of the country. The company says it’s the most new flavors ever introduced at one time from the brand. Flavors include new offerings Deep Dish Pizza (Heartland), Lobster Roll (Northeast), and Fried Pickles with Ranch (Midwest), as well as Cajun Spice (Gulf Coast), Pimento Cheese (South), Thai Sweet Chili (Pacific Northwest), Chili Con Queso (Southwest), and Crab Spice (Atlantic). Lay’s will also be re-releasing previous regional offerings: Wavy West Coast Truffle Fries in the West, Ketchup in the Northeast, and Wavy Fried Green Tomato in the Southeast. (Bacon Wrapped Jalapeno Pepper, Fried Green Tomatoes, Ketchup, and West Coast Truffle Fries are only available in-store.) Lay’s says that the flavors will be released in late July, along with a Taste Of America tour, as the brand will be making appearances at food festivals across the country. If you can’t wait, you can pre-order them online. Sounds like a good summer for fans of unusual chip flavors: not sure about Deep Dish Pizza (even though the website says it was inspired by Chicago chain Giordano’s), but would certainly be willing to give Pimento Cheese and Fried Pickles a try.